It's hard not to think of downhill, or Alpine skiing when it comes to winter in Minnesota! 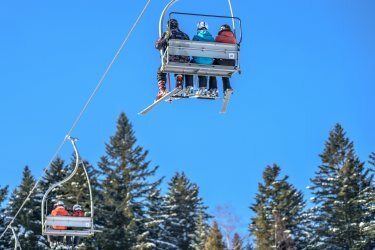 We're lucky here at Cascade Lodge to have the biggest and best alpine ski area east of the Rockies, just a stone's throw away at Lutsen Mountains! The breathtaking vistas from the tops of the Mountains, overlooking Lake Superior to the South and the Superior National Forest to the North, can't be matched anywhere in the world! Every winter, Cascade Lodge partners with Lutsen Mountains to offer special 'Ski-and-Stay' packages that offer discounted lodging and lift tickets in a convenient, one-stop package.